Cranleigh Rotarian Gill Leslie has raised more than £1,300 for Water Aid by completing a 76 mile walk from St Martha's Church to Eastbourne. In 2014, Gill walked from Winchester to the Rotary District Conference at Eastbourne and raised in excess of £2,000 for Christian Aid. This year, she planned another charity walk, covering 76 miles in four days, 11 – 14 October. 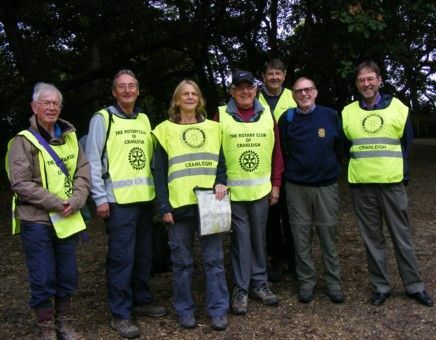 Starting at St Martha's Hill, near Guildford, she followed the Downs Link path, joining the South Downs Way near Upper Beeding, then proceeded to Eastbourne, where the Rotary District 1145 Conference was being held. Gill was hoping to attract sponsors in order to raise funds for Water Aid, an international organisation whose mission is to transform the lives of the poorest and most marginalised people by improving access to safe water, sanitation and hygiene. After her safe arrival at Eastbourne, Gill’s efforts were recognised at the conference, where a collection of £490 increased the total raised to £1300+. A number of Cranleigh Rotarians, accompanied by District Governor Frank West and Past District Governor Peter O’Keefe of the Guildford Rotary Club, turned up at St Martha's church on 11 October to give Gill a good send off (see photo).